Looks awsome on dinning table and on the patio table as well. A touch of elegance and easy to clean, cannot tell its vinyl. We like the table cloth very much. It has the look of cloth and crochet but is easy to clean on the table after each meal. Gift for my Mom. She has used this type of tablecloth on the dining room table for many years. Sometimes we can't get the oval so we get her the oblong in the same 60" X 90". Very durable and practical while giving the dining room some elegance. This tablecover really looks handmade but yet it wipes clean after use. Really dresses up your table inexpensively. I would definitely purchase this product again and again! Bought two tablecloths (different sizes for my two tables). Great product, and easy care. It looks elegant enough for fancy dining with china and crystal. Buy two of these every year for my daughters. They use them at work. These table clothes are wonderful. We use these table cloths at church. They spruce up the entire room. Looks great. Our women's group was looking for new fancy plastic table cloths. These just fit the bill. They wash and dry beautifully and really look like lace. Heirloom look, easy to clean! I usually don't leave a tablecloth on the dining room table as I was afraid of it getting stained and having to deal with that. Well this tablecloth is perfect! It looks like something you had made and it cleans up in a snap. Even with spilt Koolaid or sauce! The only suggestion I would have because it is vinyl, is when serving very hot dishes, put a placement under dish. I was hesitant to order this tablecloth because it's vinyl but WOW! It's beautiful! You can't tell it's vinyl until you actually touch it. It looks very elegant on my dining room table. I would buy this product again! feel just like the real thing. I use this tablecloth to cover my dining room table all the time. When I have company, I just put a cloth tablecloth on top of it. I am really happy that I ordered these cloths! They really look just like lace, you wouldn't be able to tell that they are vinyl...seriously. I am throwing a folky kind of vintage looking wedding and they are the perfect tablecloths. They are inexpensive and really cute. The only downside is that they are a little shiny (just use the reverse side!) and some of the vinyl wasn't properly cut out in the design so it looks like dried glue is sticking to the lace but it's a very minor problem. Get these, they're really awesome. It is very pretty on my table. I intend to get another one. I highly recommend it. This is a very attractive tablecloth but it does tend to rip easily - especially with little ones putting their fingers in the holes! This is my second one and love the durability. Very pretty crochet look vinyl tablecloth. I use with a contrasting fitted tablecloth underneath. Any color looks nice. Match your drapes or your rug or your plates. Options are endless. Be sure to wipe and dry daily. I do not recommend machine washing as the flannel backing may peel. Great quality at unbeatable price!! This beautiful crochet lace vinyl tablecover is a perfect solution for everyday use, dining room elegance or as a super gift. The vinyl is easy to clean and very durable. I have ordered from Miles Kimbell for several years now, just to get one that has a different design for later use. This style has been on my kitchen table for several years now. It displays my colored tablecloths beautifully. This is my 2nd one due to the difference of my table sizes. Use this on my kitchen table to hide where a child got marker on the wood and it won't come out. Love this product. Searched high and wide but only found it at your website. Difficult to find in stores that I went to. Really thankful and would recomment your company to my friends. Am awaitn g to receive the catalog in the mail. Needs to be in more colors than white. Beautiful, wish it came in more colors than just white. I would buy every color you sold. 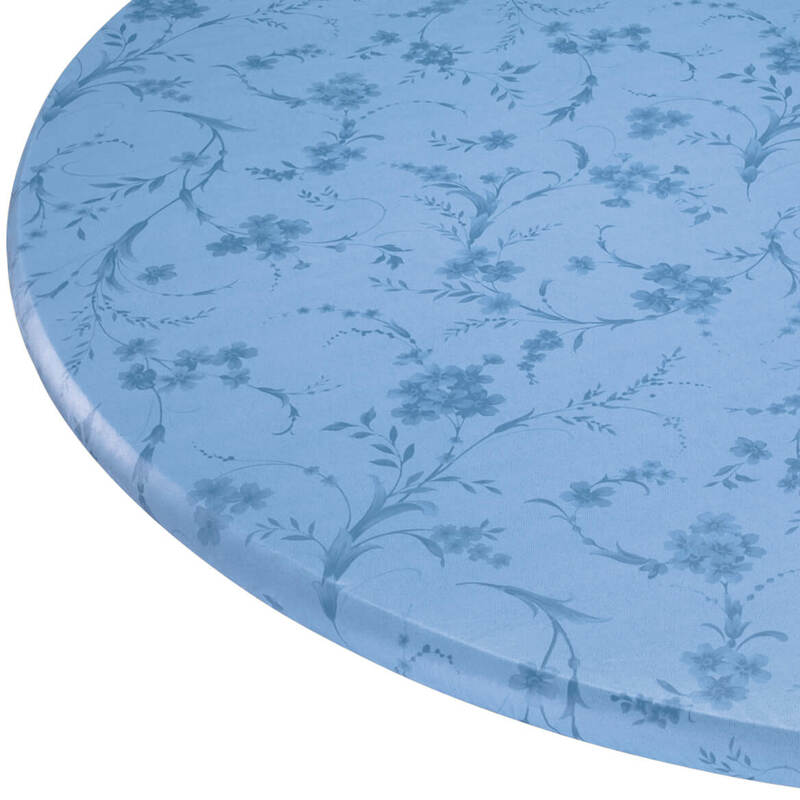 You also need a better selection of oval tablecloths than just this one. It is decorative and protects my table. It is vinyl and it protects the table. table cloth were amazed at how delicate it looks. I need to order 4 more. I use this tablecloth on my dining room table. I appreciate the availability of this item in hard to find sizes. It is very pleasing in appearance and gives great protection to my table. This vinyl table cover added a little x-tra to my kitchen. It looks like cloth, but is vinyl and extremely easy to clean after dinner. I want to buy another one just to keep on hand. LOVE IT! 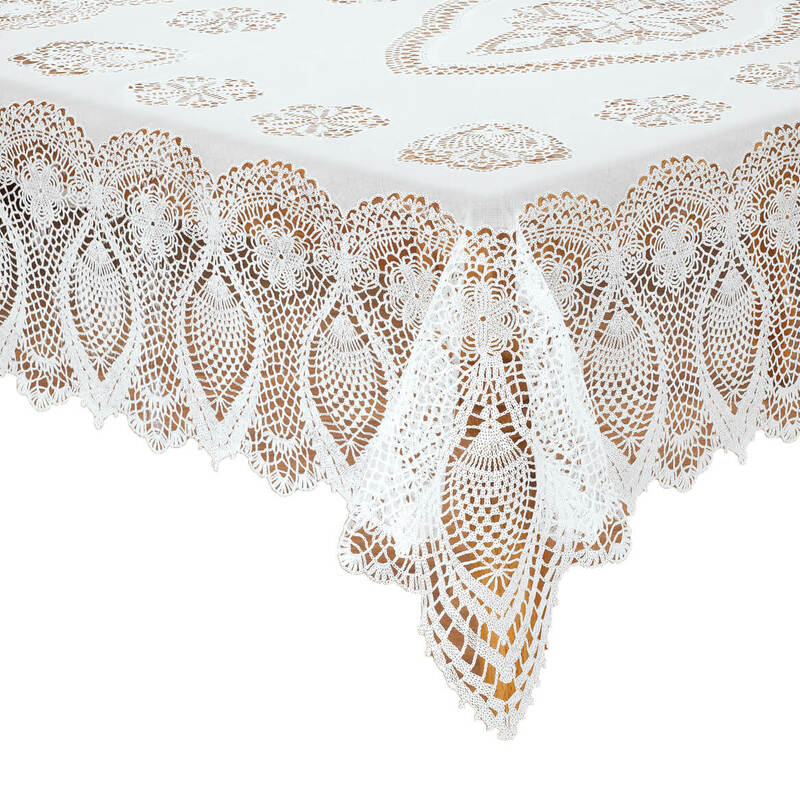 The tablecloth is of good quality and it really looks like a real lace tablecloth. It looks beautiful on my dining room table. This tablecloth combines the best of both worlds---a practical, easy-to-clean table topper that is pretty as well, and provides the same look as a high price, elegant cloth table cover. We love it! Beautiful. A bit hard to clean if you don't wipe up messy spills before they dry....but still just great. I use this on my glass kitchen table. Gives a 'rich, expensive look but very reasonable. Easy to keep clean to use over and over again. Great looking !! I love it !! I've purchased cheaper vinyl cloths over the years, and that's what they were... CHEAP!! This one looks like real linen/lace and could fool anyone, even after touching it. I do need to say that it tears easily, but that's only because one of my larger dogs decided to put her paw on the lace part to let us know that she wanted what we were eating. Sorry, Babe... no people food for you!!! It didn't tear very much, just a little in the lace part. I have no idea if you can wash this in the machine, or not, but it wipes up well. I'll buy another. I used this daily. I clean it in my sink with dishwasher detergent. I dry it outside in the sun draped over a outside chair. I love this tablecloth. Today, however, after I washed it I put my hand through the lace. I tossed it in the rubbish can. I am sad. I plan to replace it with another. I entertain with this tablecloth all the time both young and old. 4 stars because it ripped. Vinyl tablecloth looks fancy is durable! This tablecloth looks pretty on my kitchen table and protects it from scratches. It would be even better if it were a little bit thicker. It does its job well and we use it everyday. We leave it on the table all of the time. great when grand kids are here. 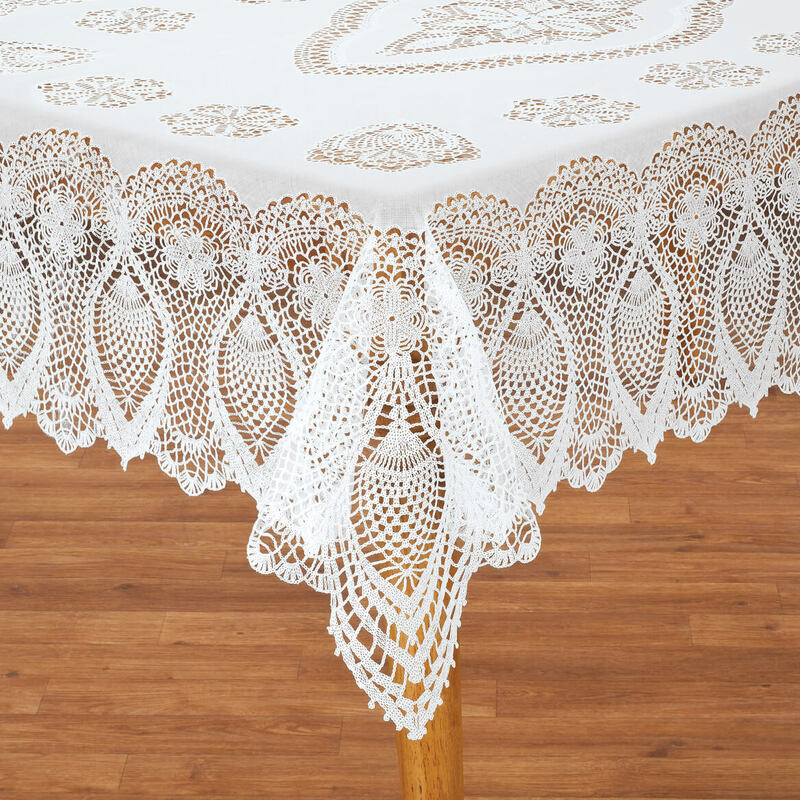 I was so delighted with the looks of the tablecloth as it looks like fine crocheted lace. One wouldn't know it's vinyl until they touched it. However, it does stain too easily, espcially foods like tomato sauce or beets. I cannot get the stains out completely and I don't know if it is machine washable. I will try washing it and see what happens. But it does add an elegant touch to my dining area. My dining room table always looks elegant and you would never know it is plastic. I never worry about spills that could ruin a cloth one. 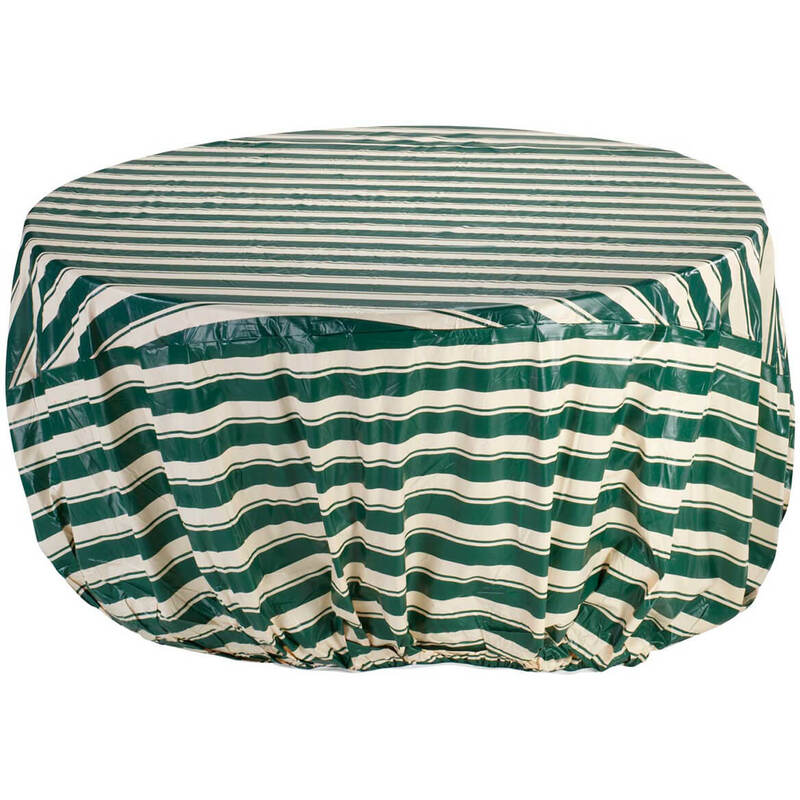 I found that finding these tablecloths was very difficult so when I discovered them here, I ordered an entire case. I purchased them for my outdoor porch that we use as a room during the summer. I have it decorated with white wicker furniture and small round tables. 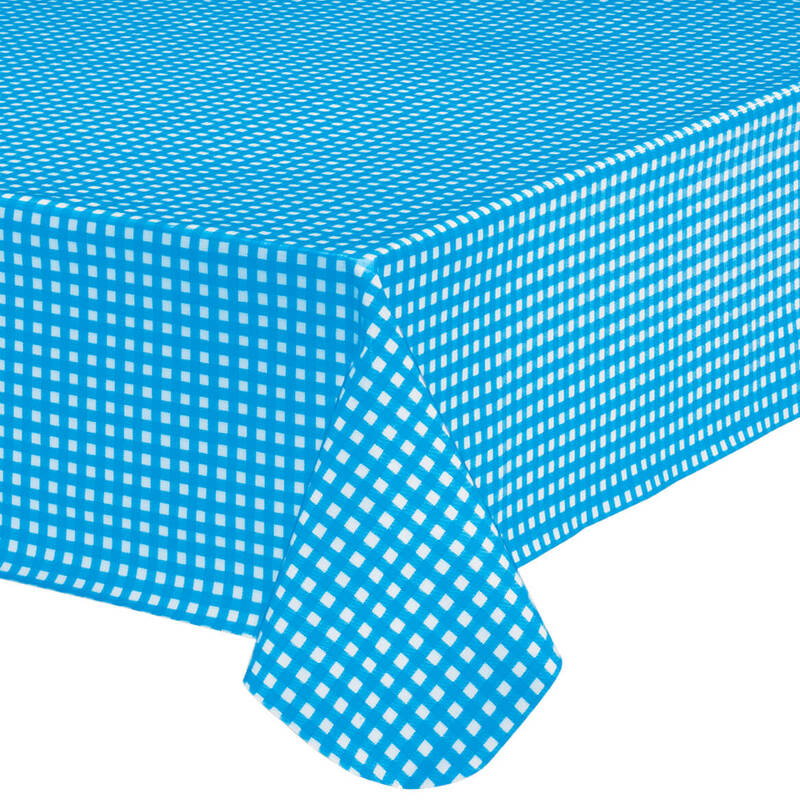 These tablecloths look lovely and are easily washed on gentle cycle. After several months in the Kansas wind, they do get torn, but at this price, I just throw them away and open a new one. We have many guests that we entertain on our porch during the summer and I always get complimented on how lovely the porch looks. They are very elegant and enhance the look of the porch a great deal. I hate constantly washing the tablecover when my toddler inevitably spills his milk. This lets me keep the nice look without all the work! After ordering it, I realized it was vinyl not fabric. Almost returned it but decided to keep it. For everyday use to protect my wooden dinette table top, a good idea and looks nice. The pineapple motif reminds me of the many doilies and table toppers my grandmother used to crochet. I bought this tablecloth as a gift to replace a similar one that my Mother has used for years. It dresses up her small dining table and is easy to clean. Tablecloth looks elegant and lovely but the pattern is a bit delicate. I washed it by machine on a hand wash cycle and it was fine the first time but the second time some of the more delicate areas tore apart. It was still usable but probably wouldn't have withstood a third washing. Nonetheless, it lasted about a year even with the machine washings and I thought it was good value for the price. Just treat it gently. What happened to this tablecloth in an oblong of 72 inches long? I have it on my table in that size and it has a few tears in it so I would like to replace it but all I see listed is the oval. Looks like real lace. Didnt realize was so flimsy. Ripped taking out of package. Good looking design. Just need to be so gentle. Tried taping from back but didnt work. My first impression is beautiful! I had planned on calling today or tomorrow with my complaint! I opened it up on Sunday, Father's day as 2 of my grandchildren would be coming over. I always use a vinyl tablecloth when they are here, then I don't care if they color or paint and of course, we all eat on it. When I put it on the table, there was an area that was ripped from the middle of one of the edges. there was also a piece of the tablecloth that fell out of the package. I am always satisfied with any product I purchase from Miles Kimball. But, I am dissapointed with this tablecloth. What can be done about it? If it needs to be returned, may I have a mailing slip sent to me so I do not have to pay for postage? I have thrown out the packaging as I didn't expect anything to be wrong with the product. I await your reply. Thank you! Just loved it for the Holidays. The Vinyl smell was strong but we AIRED it and it was better. attractive in dining room oval table over solid colored cloth cover.Have not tried to wash it yet..will see how it holds up. It is very fragile because it is rather delicate, the tips at the edge tear off easily. I wonder what washing will do in the machine. Would recommend with that warning. This table cloth is attractive, it looks like real lace. However, there are a lot of real holes that allow food and drink underneath to the table. 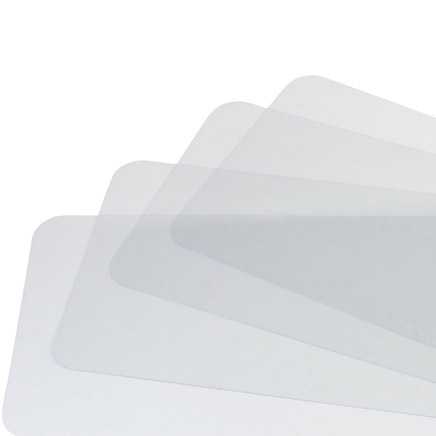 I wanted to use these for multiple uses, this will not be possible as they are so thin, they will tear quickly. I have had other tablecloths similar to this and they lasted a lot longer than this one. Put it on my table for Easter and noticed little slit marks on it. Table cover vinyl is to thin and tears easily. The crocheted lace vinyl covers we just bought are made of a very light vinyl. One tore just taking it out of the package. Three other tore when they were being folded up to put away. would not even think of putting them in the washer and dryer like we were able to do with the older ones we have. We have used the crocheted lace vinyl table cover from MK for over 10 years at the church for special occasions on our tables. The ones bought in the past were of a heavier vinyl and washable and used many times. MK was contacted about the poor quality of these table covers, and they have refunded our purchase price. Thank you MK we appreciate your great customer service. This is not a product to buy if you want to keep your table nice. My glass sweated right through it. A few drops of syrup dripped on it and it soaked right through on to the table. It also had a small tear in it when it came out of the package. I never got to use the tablecloth because when I received it the tablecloth had turned yellow. I called and was sent a replacement and the replacement was yellow too. It indicates to me that you have had these tablecloths for a long time (long enough for them to turn yellow). Have had it on our dining room table for 1 week and it already has a tear in it at the corner of the table. We haven't even eaten at the table yet and it's already torn. Nice to look at but not functional or durable. Lace tears easily. It was tearing after few days on table. Not satisfied with product. Great, until you unwrap it! I have yet to return this item, if they will even take it back.. My niece and I were putting it on the table Christmas Eve and as I unfolded/unstuck it from itself, I put my hand right through it. I would think I was too rough, but I have had 3 others of this type cover and never had a problem like this. The others just got old and dingy. It was very... stiff and unyielding..almost like it was dried out. I would not recommend this item. Looks dirty and is hard. Started tearing while taking it out of the package. need to cover table and can be wiped off. 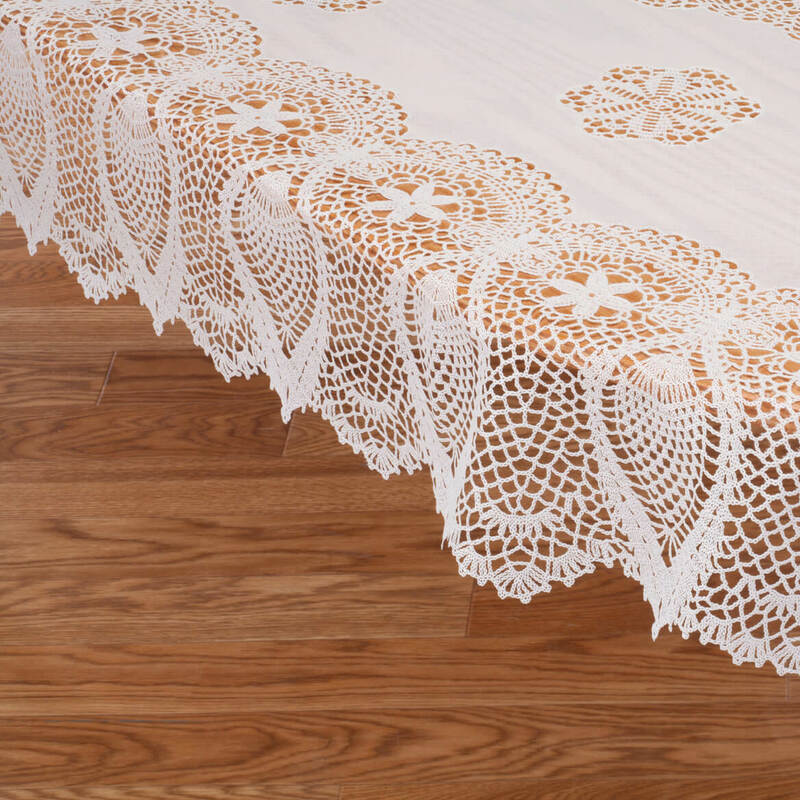 Love these plastic lace tablecloths! Very classy and convenient. I saw that they could be a tablecloth to put over a tablecloth of color so I wanted to experiment and do that so I bought a couple. Had one that lasted for years. Needed another. A person can't find vinyl tablecloths that lay nicely on the table yet they look very classic and elegant looking. I have shopped at many stores and can NOT find any like these. Thanks for having them available. Needed a petty vinyl table cover. I have ordered this in the past and love the quality and the appearance of the tablecloth. Works very well for family dinners with a liner underneath it. I already have this and I love it! It’s very hard to find an oval table cloth. Because it was what I was looking for in a vinyl tablecloth. Looks beautiful and will grace my table. daughter in law wanted it. I liked the reviews want the look, but do not want to wash real lace every time some one spills on it. Beautiful lace look and easy care vinyl. to go over a designed vinyl tablecloth. Looks pretty and easy upkeep. I bought one years ago and needed another. I have an oval dining table and this is a hard to find size in tablecloths. I may order another one later. I had seen it in another church and looked like real lace. We will be using them in our church if the committee approves. to cover over cloth tablecloth to protect the cloth and table. I want to protect my wooden tables. Needed something to make the house look nice for the upcoming holidays. I need a beautiful lace vinyl table cover for our church activity building. And this was the one and everyone on the committee loved it. Since I broug h t the blue table cloth. I wanted to dress it up. I think it would look nice on my dining room table. BEST ANSWER: Thank you for your question. The Vinyl Lace Tablecloth only comes in white. We hope this information will be of help to you. I'm confused. Some of the reviews say that it can be used for church tables and holds up well but others say that it is fragile, that the design is cut all the way through and the edges snag. I'm looking for tablecloths to use at church for a long time. Will this one work? BEST ANSWER: Thank you for your question. Yes, these will work as tablecloth that will last. We hope this information will be of help to you. my table is 60 wide and 90 long. What size do I purchase? BEST ANSWER: Thank you for your question. 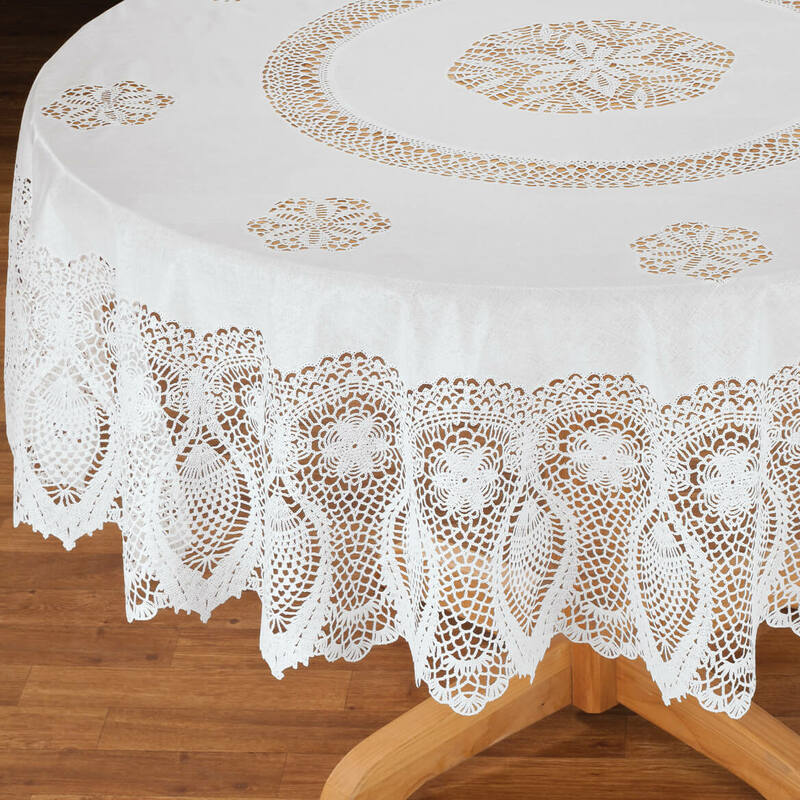 Depending on the shape of the table, this Vinyl Lace Tablecloth comes in a 60 x 90 oval and will fit a 60 x 90 oval table. However if your table is oblong or rectangle, the size will not fit. We hope this information will be of help to you. My table seats 6 and is oval--what size tablecloth should I purchase? BEST ANSWER: Thank you for your question. 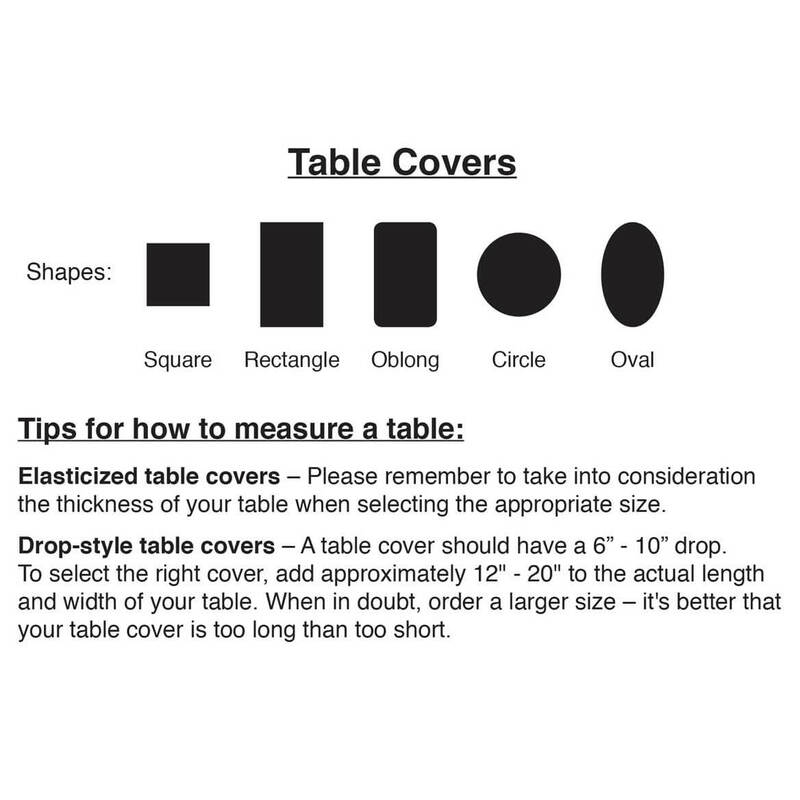 We would suggest measuring your table before ordering to ensure a proper fit. We hope this information will be of help to you. I got the 54 x 72 and it fits my 48" round table when I put the leaf in to make it oval shape. It seats 6 nicely . BEST ANSWER: Thank you for your question. The table cover comes in the 70" round size. We hope this information will be of help to you. Are the lace pieces cut out all the way through, or does it have a solid lining behind the lace? BEST ANSWER: Thank you for your question. The lace is cut through. We hope this information will be of help to you. The lace is cut all the way through. what color is it, white or ivory? BEST ANSWER: Thank you for your question. It is white. We hope this information will be of help to you. looking for this one in a 90 inch round please let me know if you have this? BEST ANSWER: Thank you for your question. Unfortunately we do not carry the table cover is 90" round. We hope this information will be of help to you. Do you sell round table cloth? BEST ANSWER: Thank you for your question. We would recommend the 54x72 to allow for overhang. We hope this information will be of help to you. 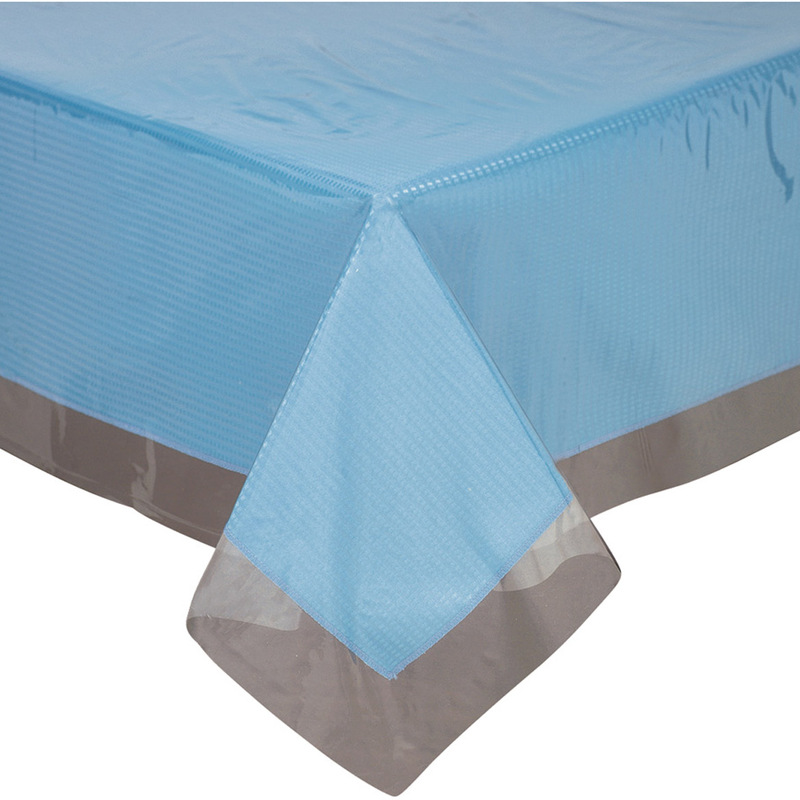 Clear tablecloth protector lets the beauty of your fine linens show through! Heavy duty clear vinyl tablecloth protector with special nonstick surface guards against stains- spills wipe off instantly.